A leading Iraqi opposition group is looking at a 5,000-foot mountain just inside Iraq's border with Iran as a potential site for a U.S.-backed radio transmitter to beam anti-Saddam Hussein broadcasts. Ahmad Chalabi, leader of the opposition Iraqi National Congress, said Thursday the mountain is in the largely autonomous Kurdish area of Iraq, about 100 miles northeast of Baghdad. Part of the mountain is in Iran. The State Department said it is open to the concept of opposition broadcasts into either Iraqi Kurd territory or neighboring Iran. It said no decisions have been made. Chalabi said he was optimistic the Bush administration will pay for the project, which he put at $178,000. He said the station could be on the air in 45 days, broadcasting news and commentary on human rights abuses and other aspects of what he called "the plight of the Iraqi people." The project is just one small aspect of a broader U.S. campaign to weaken Saddam. Officials are optimistic about the prospects for U.N. Security Council approval of a plan to tighten sanctions against Iraq that will limit Saddam's access to materials needed for weapons of mass destruction. While military action against Iraq is possible, officials say no such step is imminent. President Bush has included Iraq as part of an "axis of evil," with Iran and North Korea, that he described in his State of the Union address. The area favored by the Iraqi opposition for the transmitter is under the control of the Kurdistan Socialist Party, which supports the installation of the transmitter at the site, Chalabi said. The Kurdish region is dominated by two other parties whose backing would be helpful for the project to become operational, he said. The Kurdish area of northern Iraq has been beyond Saddam's control for years. 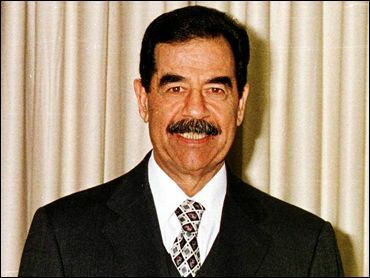 U.S. and British flights over the area are intended to prevent Saddam from using his air force to recapture sovereignty over the area. With administration backing, the INC is planning a conference soon in Washington of former Iraqi military officers who have fled the country. State Department spokesman Richard Boucher said the department is supporting a separate, broad-based conference that would be attended by a range of emigre organizations, including both military and political figures. The timing for the conference has not been set. Its purpose would be to exchange ideas, marshal support against Saddam and "demonstrate that there are Iraqis who want a different future for their country, and make clear that these people come from a variety of backgrounds," Boucher said. In related news Thursday, USA Today reported that the President has approved a covert plan to topple Iraqi leader Saddam Hussein, citing a former top CIA official who maintains contact with the agency. The newspaper quoted the former official as saying that Bush approved a new CIA plan to oust Saddam three weeks ago. The official, and another source outside government, said the spy agency already was implementing the plan, the paper said. The former CIA official was quoted as saying that the CIA plans to arm Kurdish forces in northern Iraq and to train and arm Shiite Muslims in the south. The newspaper said others, who say they are familiar with the plan, said it would also encourage defections within the Iraqi military. USA Today said neither the White House nor the CIA would confirm that such a plan exists. Bush, preparing to pursue America's war on terrorism beyond the campaign in Afghanistan, accused Iraq, Iran and North Korea of pursuing weapons of mass destruction. Bush has warned Saddam his country will face the consequences if he does not allow U.N. weapons inspectors to return. But U.S. senior officials have said Bush had not yet decided whether to take military action against Iraq. Iraq has barred the arms inspectors, charged with scrapping its chemical, nuclear and biological arms programs, since U.S. and British warplanes bombed Baghdad in December 1998. Iraq denies it has any weapons of mass destruction.